He was talking to me as local activists gave their call for social justice a festive twist, handing out free presents to children outside the Town Hall of Alès, which has one of the highest unemployment rates in France. The gilets jaunes’ revolt has been making global headlines since it sprang into life on Saturday November 17. Since then, every Saturday has been a day of action across France, numbered Acts I to VI. Roads have been blocked, factories picketed, motorway toll booths burned and countless protests staged both in Paris and the provinces. There has been a stream of astonishing images from the protests, as police use tear gas, water cannon, rubber bullets and armoured cars against demonstrators. On Saturday one police officer was filmed drawing his gun on the advancing crowd, before fleeing on a motorbike under a hail of street furniture. Meanwhile, France’s business leaders are complaining that the protests have already cost them a billion euros in lost consumer profits in the run-up to Christmas. President Emmanuel Macron’s government is clearly shaken. The few concessions he has offered have been rejected by the gilets jaunes, and the much-repeated official line that the protests are dying out sounds like wishful thinking. One of the movement’s main strengths is its decentralised nature: it boasts roots in smaller French towns and rural areas that the urban upstarts of 1968 could only have dreamed of. However, the suddenness of the gilets jaunes’ emergence has left a lot of people, particularly outside France, unclear as to what it is they actually stand for. To start with, the revolt was focused on petrol prices and appeared from the outside to be a vaguely right-wing protest against environmentally-motivated taxes. There was, and still is, certainly an element of the movement which comes from the populist far right, and this was how the gilets jaunes were initially presented in French and international media. Many left-wingers in France were put off by the nationalistic rhetoric, red-white-and-blue flag-waving and occasional reference to immigration as a problem. But others decided to take a closer look and were pleased to find that the overall spirit of the revolt was fuelled by a sense of social justice, rather than by narrow chauvinism. It was a desperate protest by people who could not cope with the cost of living in France and the disdainful attitude of the authorities: they had simply had enough. Those involved did not necessarily speak the political language of the contemporary left, but they were overwhelmingly not politicised in an opposite direction either. They often expressed the basic ideals of the left in a refreshingly direct way, usually lost and buried under decades’ worth of hackneyed sloganeering and political dogma. 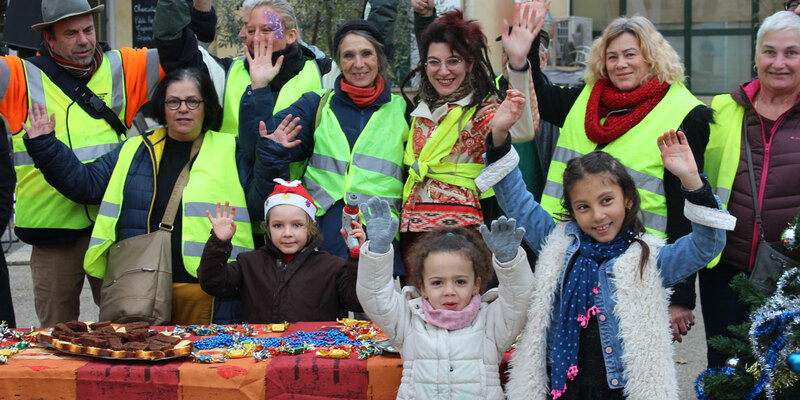 Here in Alès, members of the local anarcho-communist Exploités Énervés collective announced on December 5 that they had been talking to gilets jaunes on the roundabouts and found that this was a movement worth supporting, for all its flaws. Nationally the influential Lundi Matin journal and website, linked to the left-wing insurrectionalist Invisible Committee, came out strongly (translation) in favour of the gilets jaunes’ revolt and described the radical left as forming part of the revolutionary arrière-garde (translation) with its slowness to take part. Since then, there has been a much more obvious far-left involvement. Anti-fascists in Paris have chased extreme right-wingers out of demonstrations and parliamentary leftists such as Jean-Luc Mélenchon and François Ruffin have been prominent supporters of the gilets jaunes. The movement is so raw that it still lacks any real ideological cohesion, but its general emphasis on participative democracy leaves the French left hoping that it can be steered away from the right-wing populism of the likes of Marine Le Pen, who has been courting the movement from the start. The radical left’s support for the gilets jaunes has distanced it still further from the liberal left in France, whose distrust of the populist uprising is relayed to the public through mainstream media. A remarkable attack on the left-wing MP Ruffin in the liberal-left Libération newspaper claimed that by mixing the yellow of the gilets jaunes with the red and green of anti-capitalism, his politics had become ‘brown’, in other words fascist. For grassroots gilets jaunes, this kind of criticism is what they have come to expect from the political and media classes. Patrick, in Alès, told me that the French ruling élite, invariably from well-off backgrounds and educated at the École nationale d’adminstration (ENA), 400 miles away in Paris, had no communication at all with the general public in places like this. Hugo, another Alès gilet jaune, commented that elected officials in France were ‘far from being exemplary’. In any other field of work, people had to be answerable to those who paid their wages, but this apparently did not apply to them. They were ‘in their own bubble’ and did not seem to realise what life was like for everybody else. Patrick has been playing his part in allowing people’s views to be heard by videoing gilets jaunes in and around Alès and posting the results on two YouTube channels, Gilets Jaunes Alès and Patrick Bernard Vidéo Alès. The uprising had not come from nowhere, he stressed: ‘It’s a pressure cooker which has been suppressed for many years. There is a very high level of poverty in France, despite our significant social welfare system. Nine million people are on the brink of poverty.’ Yet he had been amazed at the way the protests had taken off so fast and he suggested that the ‘smugness’ of the widely despised President Macron had been a key factor in this. Patrick said he had also been ‘inspired by the fraternity created by the gilets jaunes’ – there was a real community spirit around the roundabout protests, with their roadblocks, discussions and shared meals. All the gilets jaunes I have spoken to in recent weeks have voiced diverse criticisms of contemporary society. Hugo, for instance, was angry at the way France claimed to stand for ‘liberty’ but was happy to profit from child labour in other parts of the world, while Patrick and his partner were outraged by the amount of plastic packaging in their weekly shop at the supermarket. The tactics adopted by various local groups are also wide-ranging. On Saturday December 22, Act VI of the gilets jaunes revolt took place all over France, with protests and police aggression in Paris, Rouen, Toulouse, Bordeaux and dozens of other cities and towns. In Alès, gilets jaunes still occupied roundabouts outside the town while others opted for a very different kind of high-visibility presence outside the Town Hall. Here they put up trestle tables and a Christmas tree and handed out free toys to children, along with cakes and hot drinks. It’s a pressure cooker which has been suppressed for many years. There is a very high level of poverty in France, despite our significant social welfare system. Nine million people are on the brink of poverty.